Beer bike is definetely about fun, sightseeing and experiencing unique activity. At our company we really focus on your enjoyment, that's why we try to keep everything as simple as possible. Probably you are in Budapest only for a couple of days, or weeks... it doesn't matter because your time is valuable. So we don't want to confuse you with all the little details and rules. Our goal is that you can book your tour in just a few clicks, and then our ever-smiling programme organisers are willing to answer all your questins and tell you all the important details. To be aware of every detail before you booking? No problem! Of course it's no problem that you are cautious before you booking your tour. We have nothing to hide. There is no additional costs or hidden details around our Beer Bike service since we are proud that most people choose our company in Budapest. We believe that the key of success is plenty of satisfied customers. So we have an another website provide you with much more details. 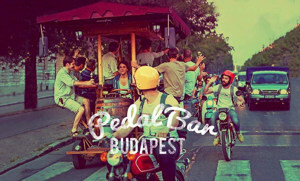 Just go to Partybike Budapest and get to know everything of Beer Bike in Budapest. Did you have great time with your friends on Beer Bike? Then we reached our goal. However, we also know that despite trying to do our best for years, once in a while it happens that you find something negative. So whether it is warm or cold we really appreciate every single feedback either on Facebook Pedal Bar or on Google+ Beer Bik Budapest. But you can also contact us via email or phone. Do you already feel like trying Beer Bike? Don't hesitate to book your tour either this website or on Party Beer Bike, after you chose your options and extras. For example what about a mulled wine or beverages beside the classic beer on tap. Just come and feel yourself good!